Dickinson’s large and varied poetry about death exists within what Joan Kirkby calls a “rich discursive context” that included a wide array of approaches and attitudes, both religious and secular. Growing up in a religiously observant household, Dickinson was subject to many Calvinist sermons on “last things” and the long Christian tradition of the ars moriendi or “craft of dying.” Barton Levi St. Armand follows the lead of scholar Nancy Lee Beaty, who traces this tradition in literature across the centuries and calls it a “liturgical drama” consisting of three main acts: 1) a proper Christian acceptance of afflictions; 2) triumph over the world by forsaking its material pleasures; 3) the actual death agony, fear of dissolution, pain, and finally visions and apparitions. Dickinson’s poetry of death contains many Calvinistic touches. The Puritans put special emphasis on “deathbed behavior,” as St. Armand labels it, which they believed was a barometer of one’s salvation. They also believed that the moment of “crossing over” could provide significant hints of the afterlife. This accounts for Dickinson’s frequent requests for information and comments about such behavior, revelations, and significant last words. In 1878, for example, she shared with Higginson that “Mr. 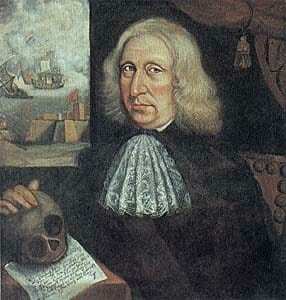 Bowles was not willing to die.” (L553). It also accounts for the setting of many of her poetic masterpieces at the very moment of death, her focus on the face and especially eyes of the dying, and other grisly details of earthly dissolution as hints about one’s eternal fate. Nineteenth-century sentimentalists, whose writing about death, especially the death of a child, Dickinson read in heaps in the periodicals of her day, modified this approach. They discarded the Puritan emphasis on damnation, “replacing it with the new and radical doctrines of justification by suffering, atonement through pain, and sanctification by death.” They also added fourth “act” or “epilogue,” the eulogies and elaborate funeral rites, the mementos, photographs, and mourning rituals of dress, veiling, and remembrance. These aspects also populate Dickinson’s poems of death. But Dickinson read works that modified such mournful approaches. She studied John Abercrombie’s scientific justification of continuous life, what we now call “vitalism” and Higginson’s endorsement of spiritualism’s drawing back the curtain of terrors theology threw over death. She read and refers in several letters to Edward Young’s The Complaint: or Night Thoughts on Life, Death and Immortality, a long poem published in nine parts between 1742 and 1745, which regarded death and its attendant questions as necessary for stimulating imaginative thought and illumination. 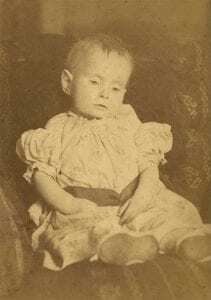 Dickinson echoed this attitude when she wrote to Higginson on the death of his baby daughter: “These sudden intimacies with Immortality, are expanse– not Peace – as lightning at our feet, instills a foreign landscape” ( L641). She reacted selectively to the popular gospel of consolation. Sometimes she accepted its formulas without question; sometimes she subverted them through exaggeration, burlesque, and distortion; sometimes she used them only as pretexts for outright skepticism and satire. Riding to meet the Earl! Link to EDA manuscript. Originally in Poems: Loose sheets, MS Am 1118.3 (247). Courtesy of Houghton Library, Harvard University, Cambridge, Mass. First published in Single Hound (1914), 79, with the first line as two, from the copy to Susan (B). Dickinson made three fair copies of this poem in 1862-63 and sent one to Susan Dickinson and one to cousins Louise and Frances Norcross. It is written in a loose common meter with much compression in the tetrameter lines for emphasis, as in the line, “Brooch – frozen on!” which is compressed to two feet. 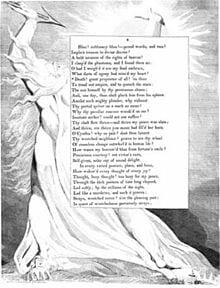 It is one of Dickinson’s ecstatic poems of reunion, sporting several exclamation points, where the speaker appears to be a woman, newly dead and buried–and thrilled at the prospect of “Riding to meet the Earl,” a male figure of stature, which could be a lover or deity. The first stanza gives several hints about the speaker’s disposition. She is wearing “the Sod Gown,” which suggests her body is in the grave, and a “Bonnet of Everlasting laces,” which suggests her soul is journeying towards Heaven or eternity. The first line also moves in these opposite directions, as the speaker describes being “Dropped into the Ether Acre!” a musical image that suggests both burial (being dropped into the ground) and the release of the soul upwards (ether is, according to Dickinson’s Webster’s, “A thin, subtil matter, much finer and rarer than air, which, some philosophers suppose, begins from the limits of the atmosphere and occupies the heavenly space. Newton”). Alongside this vertical movement is the speaker’s journey in a “Coach – of Silver” with “Horses of Blonde,” “Baggage” of “Pearl,” and an unforgettable “Whip of Diamond.” She calls this her “Journey of Down,” suggesting that the soul is as light as a feather or the travel is a soft as down, but “down” is also a directional term that points back to earth or further into the depths. Another discordant image is her “Brooch – frozen on!” It elaborates the impression of shimmering whiteness but also suggests a feeling of frigidity not altogether welcome. 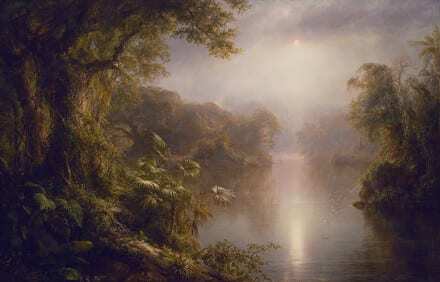 Judith Farr considers this poem in relation to the American schools of painting called “Luminism” and “Hudson River School,” 19th century movements that used light, horizons, and other luminist effects to suggest “the translated consciousness” that occurs at the moment of death. 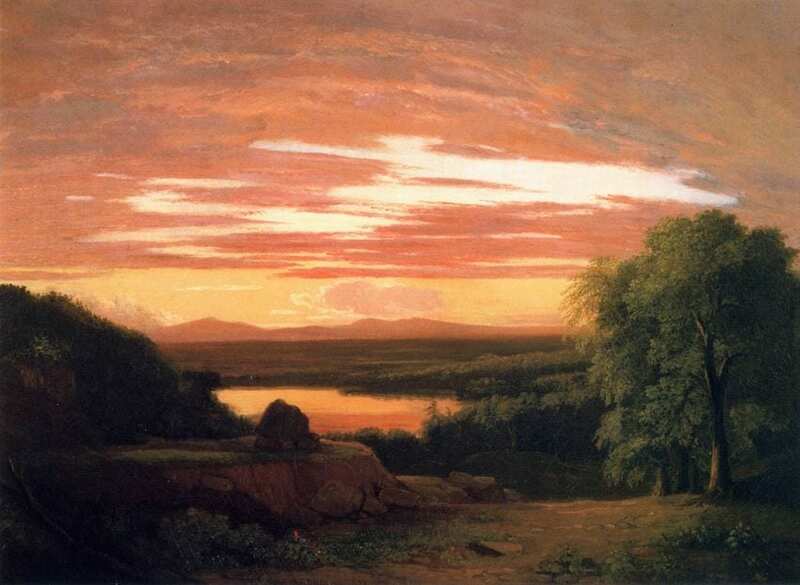 Dickinson knew Thomas Cole’s allegorical series of paintings, “The Voyage of Life” (1842). 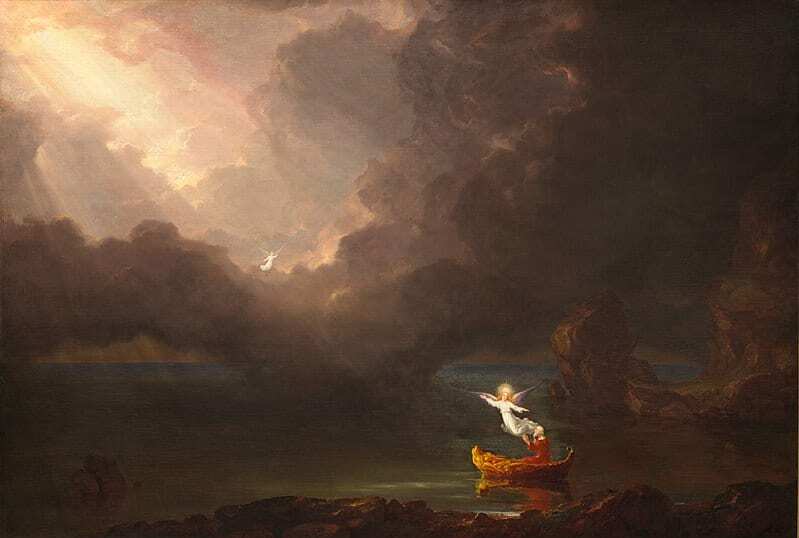 The last in the sequence, “Old Age,” depicts winged angels pointing the way to a light-filled break in the clouds for an old man in a small boat on the water. Dickinson evokes the shimmering luminescence of this painting and others in the school in her diction and imagery of pearly, pale and ghostly fantasy. It is notable, however, that in this poem, a woman drives herself (no need of the creepy “kindly” gentlemen of "Because I could not stop for Death") to a joyous reunion of souls. Farr, Judith. The Passion of Emily Dickinson. Cambridge: Harvard University Press. 1992, 311. Link to EDA manuscript. Originally in Poems: Packet XXIII, Fascicle 13 (part), (129c). Includes 11 poems, written in ink, dated ca. 1861. Courtesy of the Houghton Library, Harvard University, Cambridge, MA. First published in Unpublished Poems (1935), 12, with the alternatives not adopted. Dickinson copied this poem into Fascicle 13 in the 19th and last position sometime in early 1862. It is written in the short meter, with some compression of the lines, as befits a meditation on the brevity of life. It is part of the ars moriendi, or craft of dying, called a “memento mori” (Latin: “remember you will die”). 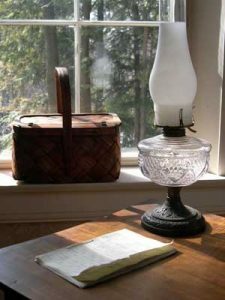 These were objects or symbols meant to remind us of our mortality and served in ascetic practice as the occasion for reflections on mortality, to help detach the mind from worldly goods and pursuits and turn one’s attention to the soul and immortality. 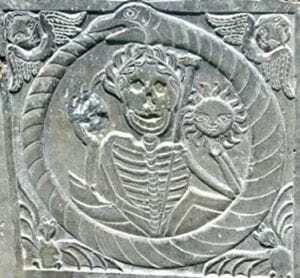 Many ages and cultures have versions of the memento mori but the Puritans who settled the eastern seaboard of North America honed the practice to a fine art. They felt it was absolutely necessary to “wean” oneself from attachment to things of this world, which are merely transient, and focus on things of the other, eternal world. They adorned their tombstones with winged sculls, hourglasses and grim reapers, exhorting the living to "remember death." In her poem, Dickinson’s speaker speaks to an unidentified “you,” recommending that if courage fails them, to “lean against the Grave” –that is, contemplate the certainty and democracy (“never any bend”) of death, in order to conquer its fear or trepidation. The fact of death holds us in “Giant … Brass arms” keeping us steady. The “nerve” or courage to do or risk what is not explained; perhaps, simply, to face the demands of life. The second stanza addresses the weakness of the “Soul” seesawing between faith and doubt or staggering under a weight. For this failure, the speaker recommends the we “Lift the Flesh door,” a resonant phrase that suggests looking beyond this life in the body to higher concerns. A “poltroon,” according to Dickinson’s Webster’s, is “An arrant coward; a dastard; a wretch without spirit or courage. – Dryden.” In this instance, the Soul is not noble but cowardly and the speaker uses a tone of contempt when it says it only needs “room to breathe.” The word “Oxygen” brings us back to the specific needs of the body, the nerves and neurons. Cameron, Sharon. Lyric Time: Dickinson and the Limits of Genre. Baltimore: Johns Hopkins University Press, 1979, 155. Douglas, Leonard. “Certain Slants of Light: Exploring the Art of Dickinson’s Fascicle 13.” Approaches to Teaching Emily Dickinson’s Poetry. Eds. Robin Riley Fast and Christine Mack Gordon. New York: Modern Language Association of America, 1989: 124-33, 133. Further Poems (1929), 99, as four stanzas of 5, 4, 6, and 5 lines, with the alternative for line 14 adopted; in later collections, as four quatrains but with rearrangement of lines 1-3. Dickinson copied this poem into Fascicle 19 in the 14th position sometime in autumn 1862. It is written in the common meter with some disruptions in lineation. The scenario of the poem sounds very much like a poetic account of Dickinson’s friendship with her cousin Sophie Holland, described in more detail in “This Week in Biography.” Sophie was her bestie at age fourteen, whose death caused the young Dickinson to sink into a “fixed melancholy,” from which it was difficult to recover. Dickinson describes sitting by her dying friend in another unnerving poem of this period, “She lay as if at play” (F412, J369) where she records physical details, such as “Her dancing Eyes– ajar,” that were the stuff of the Victorian ars moriendi. 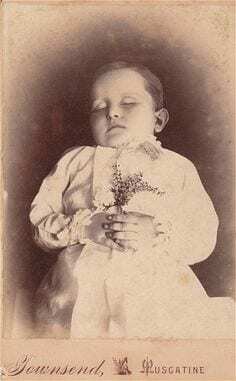 Some Victorian death photography depicts the dead with their eyes open, often retouched by the photographer. In this poem, the speaker looks back on that harrowing occasion with the detachment of age. She describes the girls as having wide-ranging discussions about everything except death and “handling Destinies” with the flippancy and innocence of youth. Their favorite topic was imagining their growth into women and being “softly raised” to the “Degree” that Victorian culture bestowed on socially compliant females. In the last stanza, they part after pledging themselves “to cherish/recollect, and to write” but the death of one of them prevents the fulfillment of their “contract.” Of course, the poem does not specify death as the culprit; rather, it is “Heaven,” by which Dickinson suggests a divine decree or predestination that separated the friends and prevented the fulfillment of their childish dreams. Cutting down the young before their time was a particularly rich topic for Victorian elegies and Dickinson would have read many in the current periodicals. But centuries before the sentimentalists, Puritan poet Anne Bradstreet wrote several elegies to her grandchildren who died in infancy that contain barely concealed (and, for the time, highly heretical) questions and doubts about the benevolence of God. Link to EDA manuscript. Originally in Poems: Packet XIII, Mixed Fasciles. Includes 27 poems, written in ink, ca. 1862, (62b). Courtesy of Houghton Library, Harvard University, Cambridge, Mass. First published in Higginson, Christian Union, 42 (25 September 1890), 393; Poems (1890), 112. The alternative readings were not adopted. Dickinson copied this poem into Fascicle 20 in the 4th place around autumn 1862. It is written in a meter of 7676 syllables with slant rhymes in the second and fourth lines. But while the first stanza is relatively free of disruptions, the second stanza has several variations, including three alternatives for the word “disperse,” which forms its own monometer line. It is the word on which the poem turns. The poem appears to describe someone who has just “departed” life and is heading for “the Judgment” on a “Mighty – Afternoon.” With the “Great Clouds” and all of “Creation –looking on,” the scene is glorious and awe-inspiring, implying the grandeur of this moment despite the anonymity of the dead person. This poem is unnervingly bereft of specific people. The striking simile of the clouds “like Ushers–leaning,” gives the scene a formal quality, as if white-gloved doormen or officers lean towards Heaven and point the way for the departing soul. Dickinson’s Webster’s notes another meaning of the word: “An under-teacher or assistant to the preceptor of a school,” which Dickinson would have experienced in her own school-days. Does she imply that this is the first day of school in Eternity? The second stanza gets more specific about this mysterious process but, at the same time, Dickinson’s variants create ambiguity and raise questions: “The Flesh – Surrendered” seems like an apt description, but was it “Cancelled” or “Shifted”? These last two words have very different meanings, especially in light of the Christian doctrine of the resurrection of the body. In John 5:24ff, Jesus outlines the two resurrections: of the body for evildoers, who will then be judged and sent to everlasting death, and resurrection to everlasting life, where the saved will have glorious and incorruptible bodies. Dickinson locates her poem at the seam between the “Two Worlds” where “The Bodiless” begins, and uses a simile of “Audiences” dispersing to “leave the Soul–alone” in a startling, echoing void. The imagery of performance resonates with the meaning of “ushers” who seat people in a theater. Dickinson provides three variants for “disperse,” an unusually large number: “dissolve,” “withdraw,” and “retire.” All bring slightly different meanings to the action, though what we are left with is an overwhelming sense of abandonment. Cynthia Wolff notes that Biblical descriptions of Judgment Day “picture a crowded affair … an ordeal passed in the company of others.” But in this poem, “desolation derives not from punishment but from solitude.” Although the poem mentions judgment, it is not depicted as rendered. This is clearly God’s realm, but Dickinson employs poetic devices that the great Christian poets had conventionally used to depict Hell. St. Armand, Barton Levi. Emily Dickinson and Her Culture: The Soul’s Society. Cambridge: Cambridge University Press, 1984, 225-27. Wolff, Cynthia. Emily Dickinson. Reading, MA: Addison-Wesley Publishing Co., Inc. 1988, 329-31. Link to EDA manuscript. Originally in Poems: Packet XXXII, Mixed Fascicles. Includes 12 poems, written in ink, ca. 1862, 173a, b). Courtesy of Houghton Library, Harvard University, Cambridge, Mass. First published in Poems (1896), 110-11. Dickinson copied this poem into Fascicle 15 in the 12th position around autumn 1862. Formally, it is as close to free verse as Dickinson comes, with little formal meter or regular stanza form and no rhymes, not even slant ones. This lack of form is, perhaps, mirrored in the poem’s subject matter: the unanswerable questions about death. The first line is staggering: What is dead, and who is commanding whom to find it? And what does it mean to find something or someone dead? To find a body or evidence of its existence? We have seen in earlier poems Dickinson’s reduction of a person, through death, to an “it.” For example, “If I may have it, when it’s dead” (F431, J577) discussed in the post on Queerness and “Of nearness to her sundered Things” (F337, J607) discussed in last week’s post on haunting, in which we find out later in the poem that the “things” of this unsettling first line are “The Shapes we buried.” These speakers have trouble identifying the dead as (formerly?) human. The questions pile up about the condition of the dead: Is it “Happy”? Is it “Conscious”? Is it “Homesick” and how do we find that out? Do we ask the “Wind” or consult “the low Ground” or ask the ghosts who return to visit us? There is no hint in this poem of consulting faith or religious doctrine for these answers. The speaker seems to be in an agnostic, if not atheistic world, one we more frequently associate with modern thinkers like Friedrich Nietzsche who posited the death of God. Link to EDA manuscript. Originally in Amherst Manuscript #fascicle 84 – They called me to the window, for – asc:1465 – p. 2. Courtesy of Amherst College, Amherst, MA. First published in Poems (1896), 184. The text was corrected in Bingham, Ancestors’ Brocades (1945), 336-37. Dickinson copied this well-known poem into Fascicle 26 in the 3rd position, sometime in summer 1863. It is a fitting conclusion to our gathering of poems about death because it rehearses many of the conventions of the Victorian drama of death and deathbed scenes, discussed in the introduction. It is written in a fairly regular hymn meter, but throws a tiny monkey wrench into its piety and sentimentality: the appearance of a pedestrian, buzzing fly. “Are we almost there? are we almost there?" Dickinson has taken the clichés of nineteenth-century popular culture and turned them in upon themselves. entirely blasphemous–but in another sense (as generations of readers have felt) true. Mortality, in the person of the monumentalized and actual Fly, possesses the grandeur of Truth defeating Illusion. Capps, Jack L. Emily Dickinson’s Reading: 1836-1886. Cambridge: Harvard University, 1966. 85, 121. St. Armand, Barton Levi. Emily Dickinson and Her Culture: The Soul’s Society. Cambridge: Cambridge University Press, 1984, 56. Vendler, Helen. Dickinson: Selected Poems and Commentaries. Cambridge: Belknap Press of Harvard University, 2010 266-68. Kirkby Joan. “Death and Immortality.” Emily Dickinson in Context. Ed. Eliza Richards. New York: Cambridge University Press, 2013, 160-168, 160-62. St. Armand, Barton Levi. Emily Dickinson and Her Culture: The Soul’s Society. Cambridge: Cambridge University Press, 1984, 41-44, 59-60.